Golf courses on the island of Jamaica offer a range of options for lovers of the sport that can rival anywhere else in the world. And, unlike Scotland, the weather is pretty nice for a day, or more, on the green. Golf enthusiasts looking for a vacation in the Caribbean will find that Jamaica has more than enough choice for almost any taste, with several championship courses, all-inclusive golf resorts and golfing options all over the island, including the Manchester Club, the oldest golf course in the Caribbean. Montego Bay is a major draw with golf courses that include Rose Hall, Cinnamon Hill, Half Moon, and the White Witch, for those who like a little ghostly legend along with their golf. For a nice, easy going round of golf, check out the course at Negril Hills just by the famous 7 mile beach. A number of resorts also offer all-inclusive golf packages or individual courses. Sandals Golf and Country Club and Jewel Runaway Bay Beach & Golf Resort are two such spots. Kingston also has a handful of courses should you be spending a day of your holiday in the capital city and want to get in a round of golf. A little outside the city is the Caymanas Golf and Country Club, a championship course with numerous elevated courses for scenic views. Closer to the heart of the city is the Constant Spring Golf Club which also offers classes for beginners for budding golfers. For a small island Jamaica offers a satisfying golf getaway no matter how serious you are about the sport. Here is a little more information about 10 of the courses we’ve mentioned. Jewel Runaway Bay Beach Resort features a championship golf course that has hosted the Jamaica Open, the Brinks (Jamaica) Classic, the Heineken World Cup Qualifier, and the famous Ryder Cup. The 18-hole, 72 par course is not an easy course but a definite pleasure to play (Blue tees 6,870 yards; White tees 6,487 yards; Red tees 5,389 yards). The greens are fairly large, fast and well bunkered and built to capitalize on the issue of playing with the wind which gets very strong at any golf course on the north coast of Jamaica. Green fees are included for guests of the resort and there is a tunnel to go from the clubhouse to the course so as to avoid crossing a busy road. A beautiful breezy spot at the foot of the hills of St. Andrew, this premier, 126-acre course, offers 18 holes with narrow fairways and relatively small greens to test your golfing skills. Constant Spring's signature hole, the 13th, is a short, drivable but narrow par 4. Miss it, and you could be in lots of trouble. It’s a fun course (Par 70; Blue tees 9,197 yards; White tees 5,866 yards; Red tees 5,205 yards) and absolute beginners can also take golf classes with accredited instructors. It is a club and the social scene is extremely friendly and welcoming. Built in 1920, it is one of the oldest on the island, from the same designer of the oldest on the island and in the Caribbean, the Manchester Club. A beautiful breezy spot at the foot of the hills of Kingston, this premier, 126-acre course, offers 18 holes with narrow fairways and relatively small greens to test your golfing skills. Constant Spring's signature hole, the 13th, is a short, drivable but narrow par 4. Miss it, and you could be in lots of trouble. It’s a fun course (Par 70; Blue tees 9,197 yards; White tees 5,866 yards; Red tees 5,205 yards) and absolute beginners can also take golf classes with accredited instructors. It is a club and the social scene is extremely friendly and welcoming. Built in 1920, it is one of the oldest on the island, from the same designer of the oldest on the island and in the Caribbean, the Manchester Club. Tryall Club boasts one of the most notable courses on the island and this 18-hole, par 71 course (Blue tees 6772 yards; White tees 6221 yards; Red tees 5233 yards) features an interesting variety of holes that offers unique challenges, and can be played various ways guaranteeing a different round each time you hit the green. The signature hole however, is the par-3 fourth hole, on which the tropical setting comes into play. The course has hosted major events like the Johnnie Walker Tournament and Jamaica's Classic Annual. Make reservations to ensure ou can get in a round as it is sometimes only open to guests. A golf academy is on hand to help improve your swing. 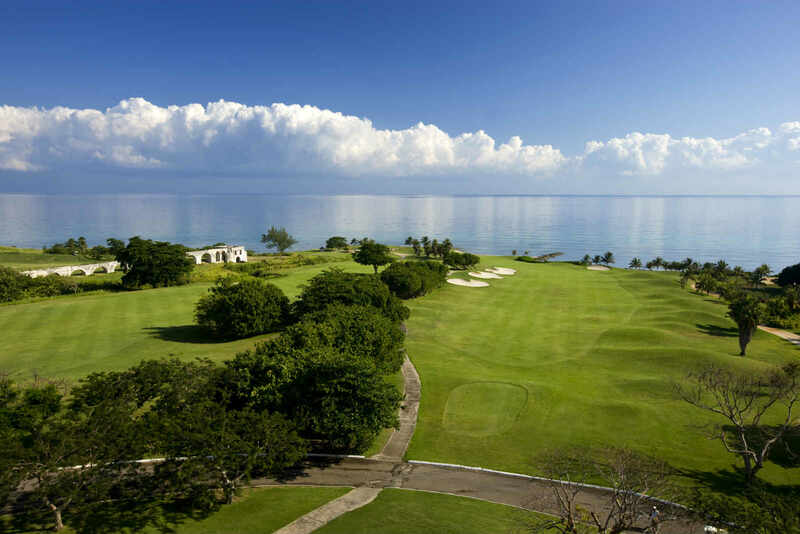 Opened in 1964, the Half Moon Golf Club hosts the Red Stripe Pro Am and is one of the best courses in Montego Bay. The 18- hole, par 72 course is quite difficult and requires plenty of strategy. It also features runway tees, undulating greens and a tricky "figure eight" layout with awkward angles that are hard to handle on windy days. Numerous bunkers are strategically situated around the fairways and greens for even more challenge. Due to the course's difficult yet playable nature, (Championship tees 7,141 yards; Competition tees 6,581 yards; Gentlemens' tees 6,233 yards; Ladies’ Competition tees 5,835 yards; Ladies'/Senior/Junior tees 5,030 yards;) Half Moon Golf Club is a popular destination for golfers. Caribbean Magazine even named it the "Best Caribbean Golf Resort." At the Rose Hall Resort & Spa, golfers are treated to some of the most scenic views and professional services in Montego Bay. 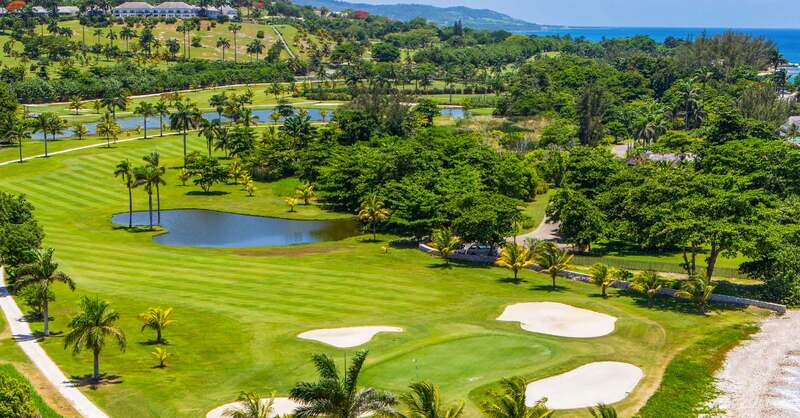 Sister course to the White Witch and alternating between seaside and mountain holes, at Cinnamon Hill you’ll experience the best of Jamaica golf as you putt on seaside greens, and you tee-off on the 17th hole, 350 feet above sea level. Scenic views frame every moment of this 18-hole par 72 course (Blue tees 6,828 yards; White tees 6,380 yards; Yellow tees 5,890 yards; Red tees 5,208 yards). The caddies here can read greens better than any pro and are rated as among “The Best in the World” by Golfer magazine, happily discussing whichever Palmer you wish to know about, be it Annee or Arnold. 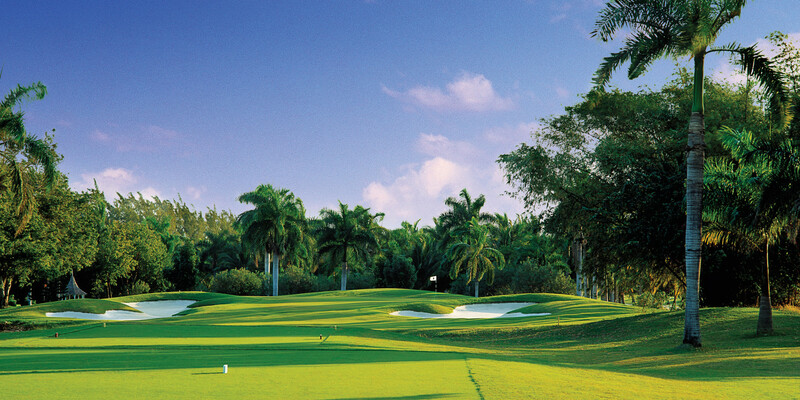 Home of the Jamaican Open for over 25 years, along with other championship tournaments, Caymanas Golf course has hosted enthusiastic golfers from over the world. The 18-hole, par 72 course offers elevated tees for you to see the obstacles that lie ahead and the 12th hole specifically shows you how tricky it is to find yourself in a rocky tree filled hillside if you don’t quite hit the mark. The course (Blue tees 6,844 yards; White tees 6,265 yards; Red tees 5,532 yards), built in 1957 and open to the public, offers up one of the most scenic courses in all of Jamaica and is one of the top championship courses in the Caribbean. This 18-hole, par 72 golf course is located about an hour- and-a-half drive from the airport in Montego Bay, and a few minutes' drive from Negril's picturesque Seven Mile Beach with beautiful cliff side resorts. The course offers awe-inspiring views of the Caribbean Sea in a casual, unpretentious setting, in other words, the very spirit of Negril. One of Jamaica’s newest courses, (Blue tees 6,333 yards; White tees 5,798 yards; Red tees 4,986 yards) it offers a challenging layout, with several elevated tees, blind greens, sharp doglegs, and steep fairways, however, it is suitable for all skill levels, and a shorter round is offered for those who want a quick game. Sandals Golf and Country Club, formerly the famous Upton Golf club, promotes a “stay-and-play” all-inclusive offer. Guests of the resort receive plenty of perks, included in their package are all green fees and PGA certified clinics two days of the week. The 18-hole, par 71 course (Blue tees 6,311 yards; White tees 6,054 yards; Red tees 4,961yards) has three sets of tees and narrow fairways with small drop off greens and beautiful views. Dating back to 1865, this 9-hole, par 35 golf course is the oldest in the entire Caribbean and certainly one of the most scenic in Jamaica. 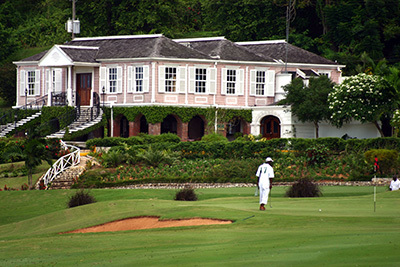 Not a part of the regular tourism set of destinations, and laid out over 55 acres of rolling hills near the quiet town of Mandeville, the Manchester Club is not only a beautiful course but definitely a unique golfing experience as a historic site. 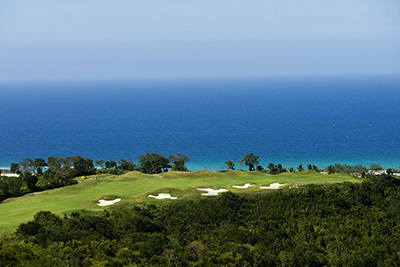 The private course with 18 tee locations, (White tees 2,865 yards) is located 2,000 feet above sea level - adding a unique element to golf in Jamaica. The course is not easy and has many slopes, sand traps, bunkers and bamboo traps. The White Witch of Rose Hall Golf Course may sound spooky, but this 6,758-yard, Par 71 (White Witch tees 6,758yards; Blue tees 6,365 yards; White tees 5,893 yards; Red tees 5,397 yards) boasts a mountainous terrain, cool trade winds, colourful foliage and spectacular ocean views from 16 of its 18 holes. Named after the former plantation’s beautiful but wicked 19th century plantation mistress, Annie Palmer, playing a round at this beautiful course has to be one of the most noteworthy golf vacation stories.